Cobalt is a transition metal appearing in the fourth period of the periodic table between iron and nickel. It is a shiny, grey, brittle metal with a close packed hexagonal (CPH) crystal structure at room temperature. The metal is rarely used as a structural material in the pure form but almost always as an alloy or a component of another system. The physico-chemical properties of cobalt allow for a hard wearing, wear-resistant metal with unique valency properties. These qualities make it unsubstitutable in a number of key sustainable and strategic applications. Colorings from cobalt oxides and silicates have been used to color pottery and glass for at least 2600 years and this was the main use of cobalt up to the 20th Century. 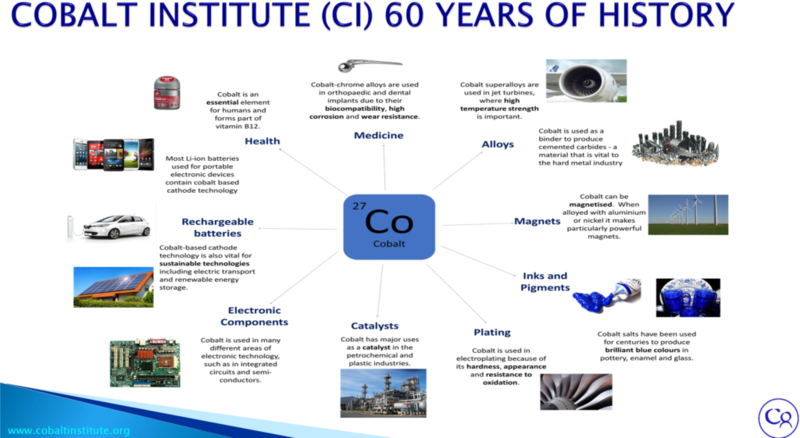 Cobalt metal itself was isolated in 1735 by G. Brandt, a Swedish scientist, and its metallic uses based on Co-Cr alloys, and super alloys in general, stem from the work of Elwood Haynes in the early 1900’s. Cobalt has increasingly been used in specialized applications where it is difficult to substitute with alternative materials. In some applications cobalt is essential, such as in medical diagnostics, pharmaceuticals and fermentation processes (e.g. bio-mass). Demand has moved towards chemical applications as a result of the large increase in demand for rechargeable batteries. In 2011, cobalt was recognized as ‘critical’ in the EU and strategically important in the USA. catalysts for more efficient chemical processing and cleaner fuels. rechargeable batteries to help increase current density and recharge-ability. propagate vaccines and enable diagnostics within healthcare. improve magnetic qualities (particularly at elevated temperature). enhance pigment color and increase drying of paints. help rubber adhere to steel bracing in tires. improve anti-corrosion properties of alloys and augment surface treatment. provide hard metals for cutting, drilling, and grinding. There are many other uses and applications of cobalt and its compounds and as a result, cobalt is widely considered the technology enabling metal. It is difficult to find a sector that doesn’t include cobalt, though it is only used in relatively small quantities in each application. 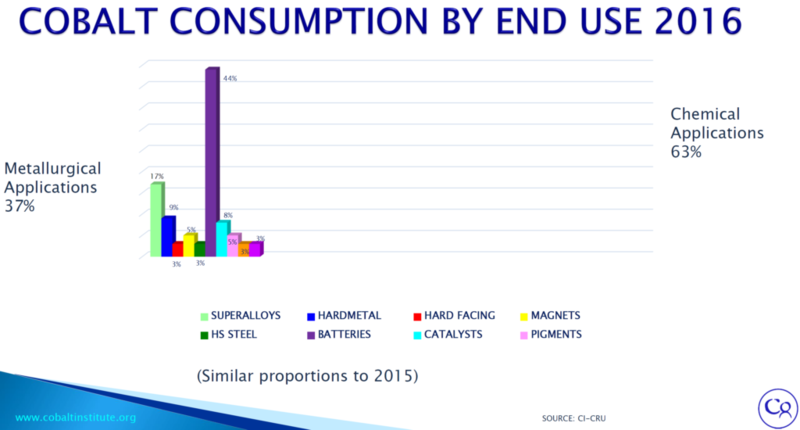 The figure below shows cobalt consumption by end use in 2016. The following is a brief discussion of cobalt applications in order of decreasing consumption. Portable devices – Mobile phones, laptops, tablets, cutting tools. E-mobility – Electric vehicles and hybrid electric vehicles, electric trains, electric bikes. Stationary – Renewable energy power stations and home storage, ancillary services to electrical grid. 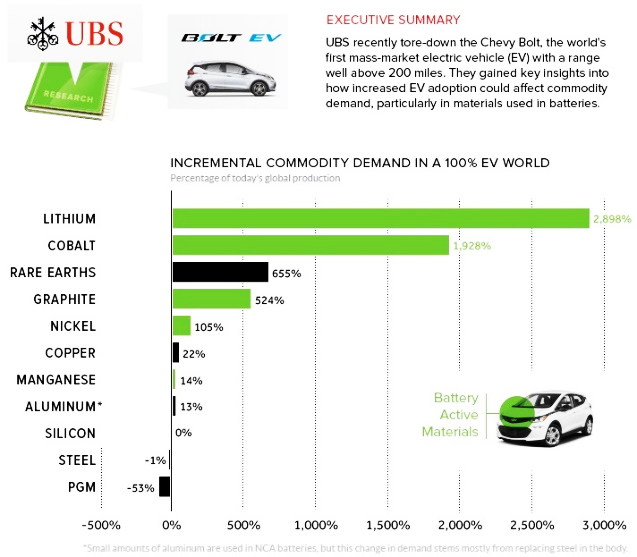 Future demand for cobalt for the coming Electric Vehicle (EV) revolution, holds the potential for large increases in cobalt demand EV batteries as shown in the table below. Rechargeable batteries are electro-chemical devices that convert chemical energy into electrical energy. Cobalt plays a key role in the cathode structure of many batteries including the lithium-ion battery which is the most commonly used type of battery with cobalt being found in the cathode. Compared to other battery types, lithium-ion batteries have superior energy, power density and superior cycling ability which are important to their use in electric and hybrid vehicles as well as energy storage systems used in renewable energy farms. Cobalt is also important in other battery technologies such as nickel-cadmium batteries (NiCd) and nickel-metal hydride (NiMH) batteries.